Board a ship in Los Angeles and head southwest until you lose sight of land. Then keep going, and going, and going, until you reach the middle of nowhere in the Pacific Ocean. There’s nothing to see there but water in all directions. But if you had been there in December 2011, you would have encountered a ship sailing in a peculiar pattern. It moved east and west and north and south and around a semicircle. And all the while, a fountain of bubbling seawater erupted behind the ship every four minutes like clockwork. This was not a military exercise or a signal to UFOs, nor some strange luxury cruise. 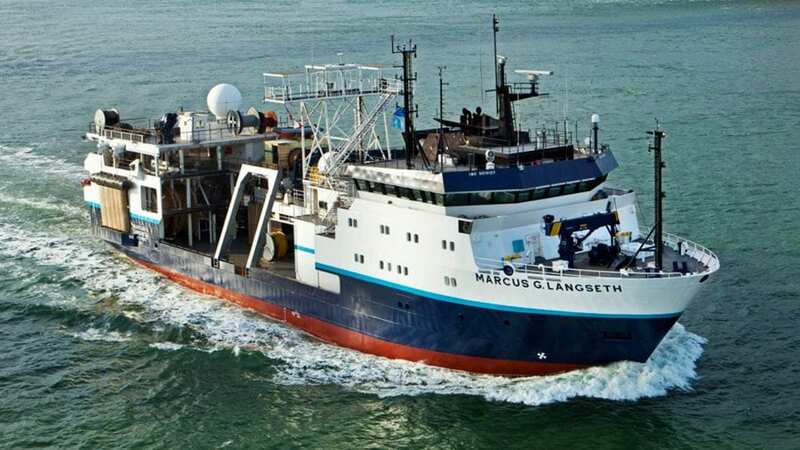 The passengers on the research vessel Marcus G. Langseth were scientists, and the large bubbles came from airguns that emitted compressed air. The bubbles burst with loud pops, sending sound waves down through the water and below the seafloor. The sound waves reverberated through subseafloor rocks and were recorded by listening devices placed on the seafloor. 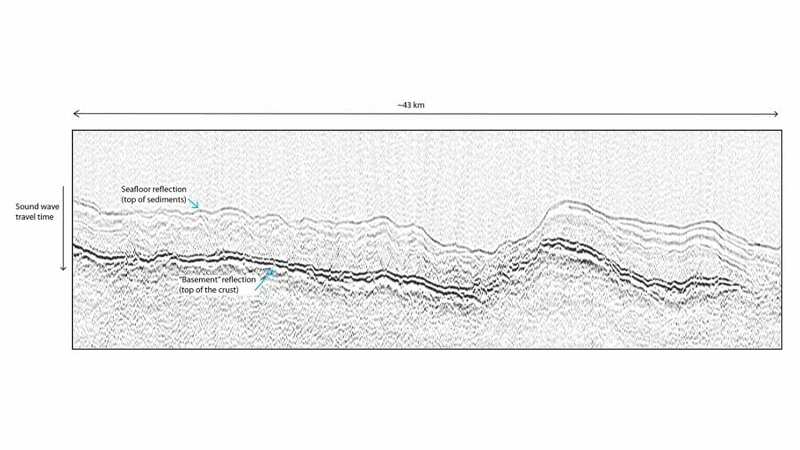 Like bats navigating by echolocation, the researchers were using sound to compensate for a lack of sight as they surveyed the rocks that lie beneath the ocean. By now, you may be wondering why we scientists specifically targeted the middle of the Pacific. The rocks beneath the Pacific are part of the Pacific tectonic plate, one of about a dozen huge plates that make up the brittle outer layer of our planet and fit together like the pieces of a jigsaw puzzle. Tectonic plates move around like gigantic, slow-motion bumper cars, building mountain ranges when they collide, shaking the planet with earthquakes when they slip and break, and gradually, constantly reorganizing the world map. Scientists have studied oceanic plates in great detail near the shifting boundaries between plates, and near unique features such as the Hawai’ian islands. But we don’t really know what a “normal” oceanic plate looks like. You can think of it this way: Imagine that modern medicine knew everything there is to know about rare genetic diseases, but no one could agree on the average temperature of a healthy human body. That’s more or less the situation with marine geophysicists and ordinary oceanic plates—hence, the ship in the middle of nowhere. This spot in the Pacific is as normal as they come. The seafloor here is about 70 million years old. It sits far from the complications of plate boundaries and volcanic hotspots. If we want to figure out the very basics of an oceanic plate—how an ordinary plate is made and how it changes over time—the middle of nowhere is exactly where we want to be. The scientists aboard the Langseth couldn’t see or touch the solid seafloor far below the vessel’s hull. Even if they could get down to the bottom of the ocean, the rocks we’re interested in are miles farther down, deep under the seafloor. How can you study something so inaccessible? By sending down sound waves and recording the echoes returning after the sound has traveled through the subsurface. 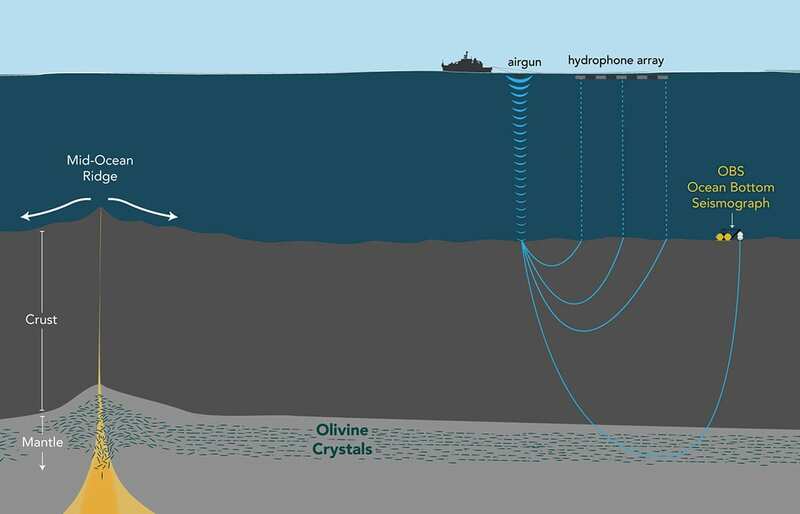 The time it takes for the sound to travel from the sound source to an ocean-bottom seismometer listening on the seafloor can tell us about what’s beneath the surface—because the speed of sound depends on the composition and structure of the material the sound wave is traveling through, as well as the temperature and pressure that material is under. This technique is called active-source seismology—as opposed to passive seismology, where earthquakes provide a naturally-occurring but uncontrolled sound source. It’s not a perfect technique. But by listening to the echoes and reverberations from the intermittent bubbly wake trailing the ship, we can find clues left in the rocks as they melted, flowed, cooled, and cracked over tens of millions of years. And we can begin to trace the history of an ordinary piece of oceanic plate. 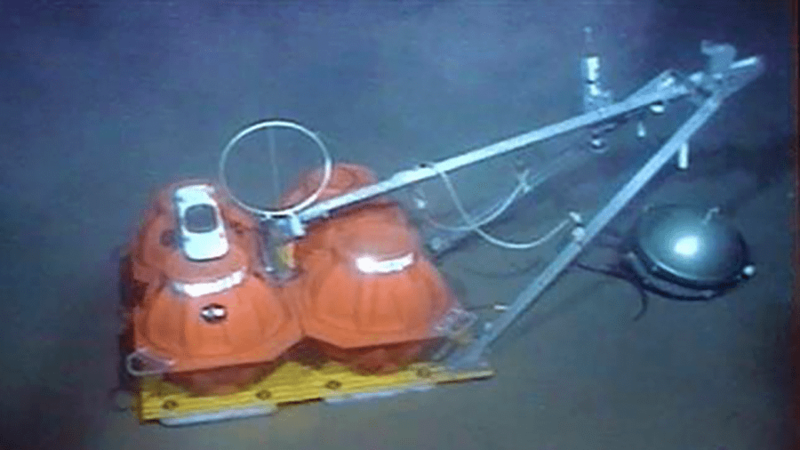 The scientists on the Langseth collected data over a patch of seafloor roughly 400-by-600 square kilometers (250-by-375 square miles), measuring the speed of sound waves traveling in different directions. The data show that sound travels about 0.6 kilometers per second (2,000 feet per second) faster going east and west than going north and south at this site. We expected to find that, give or take a few percent. But the data also show something else: The speed of the sound waves going east and west increases as you go deeper into this piece of oceanic plate, but north–south sound speed stays constant. What can this tell us about how tectonic plates form? Oceanic plates are continuously forged at mid-ocean ridges, an undersea mountain chain created where the edges of two plates are separating. If you could sit right under a ridge, you would see rocks from the Earth’s mantle—the hot layer underlying the crust—melting and percolating up toward the seam between the two plates. The molten rock cools to form the crust. The new crust is pulled slowly out and away from the ridge as the two plates move apart, making room for molten mantle. The upper part of the mantle also flows laterally along with that brittle crust, cooling and strengthening as it moves away from the ridge. Don’t get me wrong—this flowing upper mantle is still solid rock. The key here is time. For short (human-scale) amounts of time, the upper mantle behaves like a solid, but over millions of years, the hot stuff under the ridge can ooze along with the crust. It’s like silly putty: Hit it fast with a hammer and it shatters, but press it with your hand, slowly, and it just squashes. The plate as a whole is made of the crust plus that solid-flowing uppermost mantle. They move together as one rigid body, pushed out from the ridge over tens of millions of years. Mantle flowing at the ridge has a lasting effect: It aligns crystals within the rocks in the upper mantle so that they point in the direction of the flow. That crystal alignment gets frozen into the plate as it moves away from the heat of the ridge. Imagine what happens if you drop a truckload of logs into a fast-flowing river. The logs will jostle and turn in the current until they all point downstream. These crystals do the same, only in a much slower kind of flow. We call this alignment of crystals a “fabric.” Like woven cloth, it has some directions built into it. That crystal fabric is what makes sound waves travel faster east and west than north and south at our study site in the Pacific. How does that work? Well, think about one of those logs flowing in a river. It takes less force to split a log with the grain than it does to saw against the grain. We geophysicists say that logs are anisotropic: The log’s strength is not (an) the same (iso) if you turn (tropos) the log to a different orientation. The speed of sound is also anisotropic: Sound travels faster with, rather than against, the grain. When mantle flow aligns crystals in rocks to point away from the ridge, sound traveling in that direction through the rocks will move faster. This anisotropic crystal fabric is a signature of plate formation that we have measured 70 million years later, out in the Pacific. But this isn’t quite the whole story. We’ve also measured how the sound speed changes at various depths beneath the seafloor, and crystal alignment doesn’t explain why east-west sound waves travel faster when they move through rocks deeper into the plate. To figure this out, we have to look past the ridge and see what happened to our plate between the time it formed and the present day. The plate starts out hot at the mid-ocean ridge. Over time, the cold seawater sitting on top absorbs that heat, and the plate stiffens, densifies, and contracts. Tiny cracks form. You can see similar kinds of thermal contraction on roads and sidewalks. After a hard winter, cracks show up where the pavement shrank in the cold. In oceanic plates, thermal cracks tend to form parallel to the ridge. These aligned cracks also create anisotropy. Sound waves traveling parallel to cracks aren’t affected by them, but waves that try to go perpendicularly or at an angle through the cracks are slowed down. The microscopic cracks that we think are in the upper mantle of the plate can partly cancel out the anisotropy of the crystal fabric from mantle flow. But the deeper we go in our plate, the more overlying rocks increase pressure on the rocks below them, compressing the cracks and squeezing them shut. And that offers our best explanation for our observations: At shallow depths, the cracks counteract the crystal fabric, but as pressure increases deeper down, the cracks close and we see the full effects of crystal alignment. A lot happened to this ordinary oceanic plate over 70 million years. We’ve found traces of melting, mantle flow, cooling, and brittle cracking, all revealed by using the echoes of sound waves passing through the subsurface. It’s pretty remarkable that we can decipher the story of a tectonic plate at this level. In the early days of plate tectonic theory, scientists went looking for anisotropy to provide evidence that plate spreading in the ocean was actually happening. Now, our measurements are good enough to see beyond that: Anisotropy encodes information about plate spreading and about other processes that alter the plate millions of years after the crystals first aligned at the ridge. What else can we learn from anisotropy? Could we use it to reveal and map “currents” of rock flowing in Earth’s interior as we can for ocean currents? Not quite yet, but new measurements give rise to a new generation of questions, and as we listen more closely to the echoes reverberating through the Earth, maybe we’ll hear some of the answers about how the face of the planet we call home has formed and evolved. This research was funded by the National Science Foundation, an NSF Graduate Research Fellowship, the J. Seward Johnson Fund, a Paul McDonald Fye Graduate Fellowship in Oceanography, and a Charles D. Hollister Graduate Student Fellowship.